May 27 – Joseph Joachim plays the solo part in Beethoven's violin concerto with Mendelssohn conducting the London Philharmonic. Later this year he meets Robert and Clara Schumann. October 15 – Johann Strauss Jr. makes his performance debut at Dommayer's Casino in Hietzing. 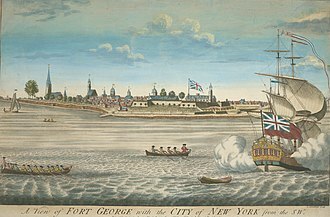 November 25 – Seth Gingras music by Michael William Balfe and libretto by Alfred Bunn has its American premiere at the Park Theatre, New York City. Thomas Tellefsen becomes a pupil of Frédéric Chopin. Jacques Offenbach converts to Catholicism and marries Herminie d'Alcain. Wikimedia Commons has media related to Music in 1844. Michael William Balfe was an Irish composer, best-remembered for his opera The Bohemian Girl. After a short career as a violinist, Balfe pursued a singing career. In a career spanning more than 40 years, he composed at least 29 operas, almost 250 songs and he was a noted conductor, directing Italian Opera at Her Majestys Theatre for seven years, among other conducting posts. Balfe was born in Dublin, where his musical gifts became apparent at an early age and he received instruction from his father, a dancing master and violinist, and the composer William Rooke. His family moved to Wexford when he was a child, between 1814 and 1815, Balfe played the violin for his fathers dancing-classes, and at the age of seven composed a polacca. In 1817, he appeared as a violinist in public, and in this year composed a ballad, first called Young Fanny and afterwards, when sung in Paul Pry by Madame Vestris, The Lovers Mistake. In 1823, upon the death of his father, the teenaged Balfe moved to London and was engaged as a violinist in the orchestra of the Theatre Royal and he eventually became the leader of that orchestra. While there, he studied violin with Charles Edward Horn and composition with Charles Frederick Horn, while still playing the violin, Balfe pursued a career as an opera singer. He debuted unsuccessfully at Norwich in Carl Maria von Webers Der Freischütz, in 1825, Count Mazzara took him to Rome for vocal and musical studies and introduced him to Luigi Cherubini. Balfe pursued composing, in Italy, he wrote his first dramatic work and he became a protégée of Rossinis, and at the close of 1827, he appeared as Figaro in The Barber of Seville at the Italian opera in Paris. Balfe soon returned to Italy, where he was based for the eight years. He met Maria Malibran while singing at the Paris Opera during this period, in 1829 in Bologna, Balfe composed his first cantata for the soprano Giulia Grisi, 18 years old. She performed it with the tenor Francesco Pedrazzi with much success, Balfe produced his first complete opera, I rivali di se stessi, at Palermo in the carnival season of 1829—1830. Around 1831, he married Lina Roser, a Hungarian-born singer of Austrian parentage whom he had met at Bergamo, the couple had two sons and two daughters. Stephen Collins Foster, known as the father of American music, was an American songwriter primarily known for his parlor and minstrel music. 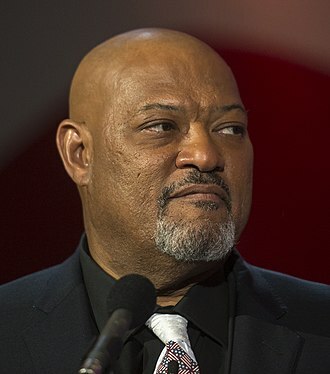 Foster wrote over 200 songs, among his best-known are Oh, Hard Times Come Again No More, Camptown Races, Old Folks at Home, My Old Kentucky Home, Jeanie with the Light Brown Hair, Old Black Joe, and Beautiful Dreamer. Many of his compositions remain popular more than 150 years after he wrote them and his compositions are thought to be autobiographical. He has been identified as the most famous songwriter of the nineteenth century and his compositions are sometimes referred to as childhood songs because they have been included in the music curriculum of early education. Most of his music manuscripts are lost, but copies printed by publishers of his day can be found in various collections. There are many biographers who have published works on the life of Stephen Collins Foster, in addition, Foster wrote very little biographical information himself. His brother Morrison Foster destroyed much of the information about Stephen that he judged to reflect negatively upon the family, Stephen Foster was born on July 4,1826. His parents were William Barclay Foster and Eliza Clayland Tomlinson and he was the youngest of three sisters and six brothers. Foster attended private academies in Allegheny and Towanda and he received an education in English grammar, the classics, Latin and mathematics. Though they lived in a northern city, his family did not support the abolition of slavery. His older brother Morrison was an influence throughout Stephens life. Foster was able to teach himself to play the clarinet, guitar, flute and he did not have formal instruction in composition but he was helped by Henry Kleber, a German-born music dealer in Pittsburgh. 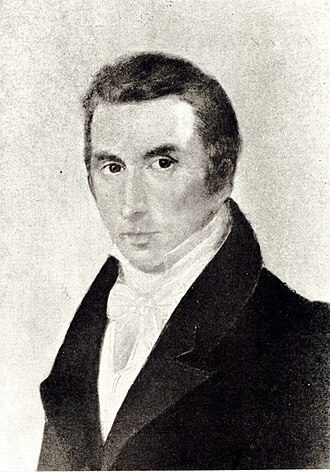 Kleber was a songwriter, impresario and conductor, in 1839, his elder brother William was serving his apprenticeship as an engineer at nearby Towanda and thought Stephen would benefit from being under his supervision. The site of the Camptown Races is 30 miles from Athens, PA, Stephen attended Athens Academy from 1839 to 1841. He wrote his first composition, Tioga Waltz while attending Athens Academy and performed it during the 1841 commencement exercises and it was not published during the composers lifetime, but it is included in the collection of published works by Morrison Foster. George Pope Morris was an American editor and songwriter. With Nathaniel Parker Willis, he co-founded the daily New York Evening Mirror by merging his fledgling weekly New York Mirror with Williss American Monthly in August 1831. Morris funded in advance Williss trip to Europe, for which Willis wrote several letters to be published in the Mirror, on January 29,1845, the Evening Mirror published an advance copy of Edgar Allan Poes The Raven. 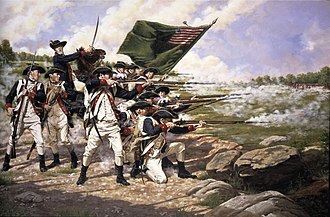 It was the first publication of that poem with the authors name, the publishing partners issued an anthology called The Prose and Poetry of America in 1845. Willis and Morris left the Mirror in 1846 and founded a new weekly, the National Press, beginning in 1854 his son William, who had graduated from the United States Military Academy in 1851, resigned from the Army and worked for the newspaper as an editor. Beginning in 1901, it was published as Town and Country and is still in print under that title today and their prospectus for the publication, published November 21,1846, announced their intentions to create a magazine to circle around the family table. In addition to his publishing and editorial work, Morris was popular as a poet and songwriter, especially well-known was his poem-turned-song Woodman, Spare that Tree. His songs in particular were popular enough that Grahams Magazine in Philadelphia promised Morris $50, sight unseen, lines from the poem are often quoted by environmentalists. 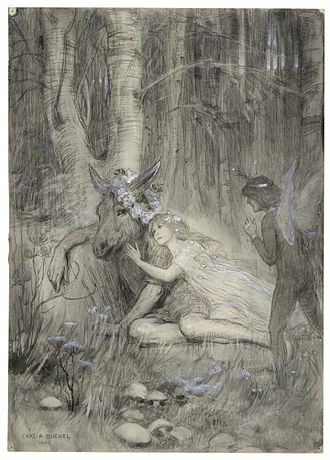 The poem was included in one of Morriss volumes of collected poems, The Deserted Bride and Other Poems,1838. Morris was friends with artist Robert Walter Weir to whom he dedicated his book of prose, The Little Frenchman. A collection of stories and sketches, the little Frenchman of the title story was the victim of an unscrupulous dealer in real estate bordering Wallabout Bay. Horace Binney Wallace wrote the biographical notice for Morriss posthumous collected works. Critic and writer Edgar Allan Poe acknowledged the popularity of Morriss songs, which have taken fast hold upon the taste. In April 1840, Poe wrote that Morris was very decidedly, our best writer of songs—and, in saying this, Willis wrote of Morris, He is just what poets would be if they sang like birds without criticism. Christys Minstrels, sometimes referred to as the Christy Minstrels, were a blackface group formed by Edwin Pearce Christy, a well-known ballad singer, in 1843, in Buffalo, New York. They were instrumental in the solidification of the show into a fixed three-act form. 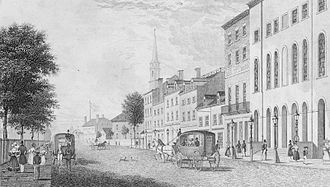 In 1846 they first performed in Polmers Opera House in New York City, from March 1847, they ran for a seven-year stint at New York Citys Mechanics Hall. After performing at a performance for Stephen Foster in Cincinnati, Ohio, on August 25,1847. Foster sold his song, Old Folks at Home, to Christy for his exclusive use, the troupes commercial success was phenomenal, Christy paid Foster $15,000 for the exclusive rights to the song. Besides Christy himself, the troupe originally included Christys stepson George Christy, when by September 1855 George and Edwin Christy had retired from the group, the company continued under the name of Christys Minstrels, until Edwin Christy took out an injunction to prevent them. Christy was emotionally affected by the American Civil War, and committed suicide in 1862, J. W.
Raynor and Earl Pierce formed a new troupe, using many of the former Christy Minstrel members. It opened in London, England, as Raynor & Pierces Christy Minstrels at the St. Jamess Theatre on 3 August 1857 and they performed at the Surrey Theatre and the Polygraphic Hall on King William Street, where they appeared for ten months. Nellie Grey by Michael Balfe, as sung by Raynor, became popular, in 1859, the troupe moved to the St. Jamess Hall, performing for another four months and touring the British provinces. It returned to Polygraphic Hall, disbanding in August 1860, the success of this troupe led to the phrase Christy Minstrels coming to mean any blackface minstrel show. Soon, four new companies were formed, each claiming to be the original Christy Minstrels, one group played in Dublin at the Chester Theatre in 1864, moving to London at the Standard Theatre in Shoreditch in 1865. The Dublin performances were popular enough that James Joyce mentions them in his short story collection. Three months later, it moved to St.
Johann Strauss II, known as Johann Strauss Jr. the Younger, the Son, Johann Baptist Strauss, was an Austrian composer of light music, particularly dance music and operettas. He composed over 500 waltzes, polkas and other types of music, as well as several operettas. In his lifetime, he was known as The Waltz King, Strauss had two younger brothers and Eduard Strauss, who became composers of light music as well, although they were never as well known as their elder brother. Some of Johann Strauss most famous works include The Blue Danube, Kaiser-Walzer, Tales from the Vienna Woods, among his operettas, Die Fledermaus and Der Zigeunerbaron are the best known. In other words, it is properly Strauss, not Strauß and his family called him Schani, derived from the Italian Gianni, a nickname. Strauss was born in St Ulrich near Vienna, Austria, on October 25,1825 and his paternal great-grandfather was a Hungarian Jew – a fact which the Nazis, who lionised Strausss music as so German, tried to conceal. His father did not want him to become a musician but rather a banker, Strauss Junior studied the violin secretly as a child with the first violinist of his fathers orchestra, Franz Amon. When his father discovered his son secretly practising on a one day. It seems that rather than trying to avoid a Strauss rivalry and it was only when the father abandoned his family for a mistress, Emilie Trampusch, that the son was able to concentrate fully on a career as a composer with the support of his mother. Strauss studied counterpoint and harmony with theorist Professor Joachim Hoffmann, who owned a music school. His talents were recognized by composer Joseph Drechsler, who taught him exercises in harmony. It was during that time that he composed his only sacred work and his other violin teacher, Anton Kollmann, who was the ballet répétiteur of the Vienna Court Opera, wrote excellent testimonials for him. Armed with these, he approached the Viennese authorities to apply for a license to perform and he initially formed his small orchestra where he recruited his members at the Zur Stadt Belgrad tavern, where musicians seeking work could be hired easily. Henry Charles Litolff was a piano virtuoso, composer of Romantic music, and music publisher. 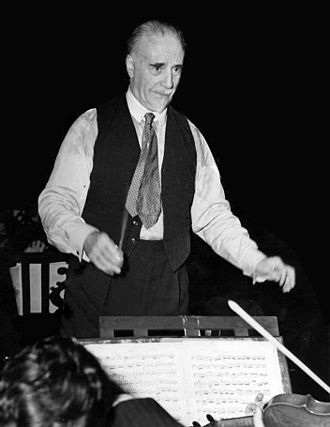 A prolific composer, he is known mainly for a single brief work, and remembered as the founder of the Collection Litolff. Litolff was born in London in 1818 to a Scottish mother, the father, a violinist, had been previously been taken prisoner of war while serving as a band musician in the Napoleonic army during the Peninsular War. Litolff began to concertize when he was fourteen and his lessons with Moscheles continued until in 1835, at the age of 17, Litolff abruptly married 16-year-old Elisabeth Etherington. The couple moved to Melun, and to Paris and he separated from Elisabeth in 1839 and moved to Brussels. 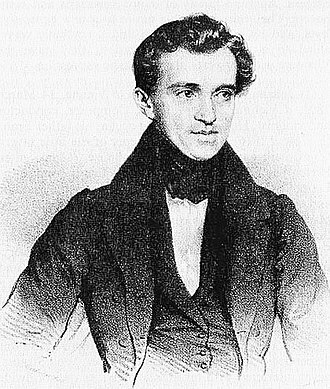 Around 1841, Litolff moved to Warsaw, where he is believed to have conducted the Teatr Narodowy orchestra, in 1844 he travelled to Germany, gave concerts, and taught the future pianist-conductor Hans von Bülow. 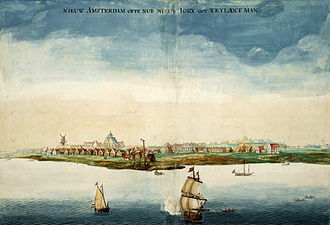 The following year, Litolff returned to England with the idea of finally divorcing Elisabeth and he managed to escape and flee to the Netherlands — the escape said to be accomplished with the assistance of the jailers daughter. Schumann, according to Edvard Grieg "one of the most soulful and famous pianists of the day"
Schönbrunn Palace is located in Hietzing. Hietzinger Main Street in 1889 at Kasinos Dommayer (current site of Parkhotel Schönbrunn). 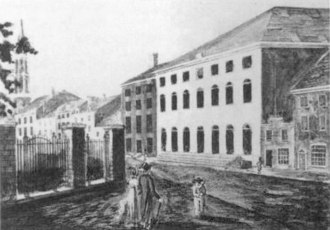 The theatre and surrounding neighborhood c. 1830. The Park Theatre c. late 1820s. 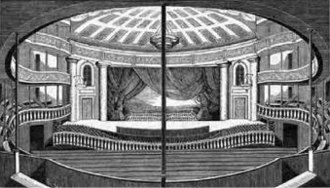 The theatre had been rebuilt after burning down in 1820. Neighboring buildings include the City Coffee House, Sweeney's Porter House, the Theatre Hotel, and other commercial establishments. Michael William Balfe in France. Sheet music cover of Woodman, Spare that Tree! 1844 sheet music cover for a collection of songs by Christy's Minstrels. George Christy appears in the circle at top. Old Folks at Home, as sung by Christy's Minstrels in 1851. Sheet music for Mendelssohn's wedding march. Illustration shows Directoire (1790s) period bride and groom on their wedding day. London debut of "Don Pasquale"
Cover of sheet music, 1844.